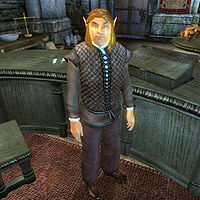 Thoronir is a Bosmer trader and proprietor of The Copious Coinpurse in the Market District of the Imperial City. He sells general goods, and has the best prices in town, but his sources may be somewhat unsavory... You can buy the unique Imperial Breeches from him only. He also sells the rare weightless shirt with suspenders. If he dies, his body never disappears. Like the other merchants in the district, Thoronir lives a life of hard work and very little spare time. He sleeps in the private quarters above his shop every night between midnight and 6am. After waking up, he heads downstairs and eats his breakfast in the main trading room. At 8am, he unlocks the doors and spends the next twelve hours offering his services to the occasional customer. At 8pm, he closes up shop and leaves. On Morndas, Middas and Fredas he will go to the Merchants Inn and enjoy both his dinner and the company of the other traders. On Tirdas, Turdas and Loredas he heads for an evening stroll around the city’s popular Arboretum and on Sundas, he goes to the Temple of the One for an evening prayer. He always heads back to his shop and finds his bed at midnight. When you reach Stage 20 of the related quest, Thoronir will keep following his regular schedule but will break it off at 11pm to secretly meet up with his questionable supplier Agarmir in the backyard behind his store. The two of them will stay in the backyard all night before returning to their regular schedules at 7am. If you ”overhear” their conversation, Thoronir will end it and go straight home to bed. His choice in clothing is typical middle-class: A pair of burgundy linens, a quilted doublet and doeskin shoes. He carries around his shop key and a large sum of gold. When you meet him for the very first time, he will say: "What kind of deal can I make for you today?" And if you ask him about his city of choice, he will be more than self-assured: "I have the best prices in town? Why? I’m smart, and you’re smart. We know the right people, we get the best deals." Unfortunately, Thoronir's idea of "the right people" is far from perfect and when you start to investigate his business methods, you will get an "inventory" option and the following question: "What about my inventory?" If you choose to ask him where he gets his cheap wares, he will say: "Well, that would be a trade secret. I can’t divulge how I pass the great savings on to you, now can I? Just like a baker not revealing his best recipes, I must keep my sources anonymous or every merchant in town would use them. Suffice to say, they are quite reliable and low cost. That way, you walk out with a full coinpurse!" If you choose to accuse him of stealing his wares, he will get angry and throw you out: "You have some nerve! Where do you come off accusing me of something you know nothing about? Now, either buy something or get out." If you choose to play nice and compliment him on his selection, he will proudly say: "Well thank you! It’s not only a fine assortment of goods, but a bit of a treasure trove; you never know what I’ll have in stock. I can see by the look on your face you wonder where I get all these fantastic items. I’ll tell you what I tell everyone else who asks. It’s all about who you know. My sources are good, but they are secret. Anyway, have fun looking around, and when you are ready to buy, give me a shout." After you have uncovered the horrible truth about his secret business associate and things have been sorted out, Thoronir will begin the task of re-gaining his reputation in the District: "I’ve come to some decisions. I intend to donate all of the money I have made, as well as what is left of these stolen items to the temple. I also want you to know that I had a long discussion with Jensine, and I have decided to join the Society. I realized you risked your life to give me a chance, and Thoronir never forgets things like that. Accept this ring as a humble reward. It’s the least I can do to say thank you. Now, don’t be a stranger! The Copious Coinpurse is still in business." And he will add: "I have disposed of all my ill-gotten merchandise, and replaced it with more expensive, but carefully obtained items." Esta página foi modificada pela última vez à(s) 10h09min de 27 de junho de 2013.